An effective and easy solution to prevent sump pump discharge line back-up and guard against flooding, Freeze Relief is an automatic overflow device that allows water to evacuate from the sump basin even if the line freezes or becomes blocked. With no switches to turn on or hoses to attach, it''s a maintenance-free way to guard against basement or crawl space flooding and sump pump burn out. Completely eliminates pumped water from being blocked and flowing back into the sump basin, forcing the pump to work nonstop. With an overall height of 6", Freeze Relief has a 1 1/2" top diameter and 3" or 4" bottom diameter that is simple to connect and can save sump pumps and prevent potential flood damage. Freeze Relief is designed to transition from a standard 1-1/2" PVC line coming from the sump pump to a 3" evacuation line to provide maximum flow. 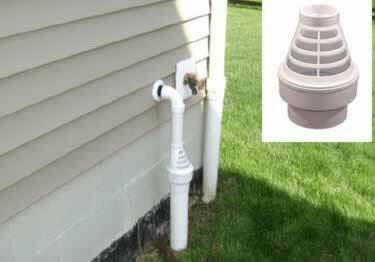 The optional 1-1/2" Pipe Collar can be installed where the discharge line exits the house to help achieve a cleaner look once installed. Also available is the optional Freeze Relief 4" to 3" Reducer. With a 4" diameter on one end and 3" at the other, the reducer is used to connect the Freeze Relief to a standard exterior 3" discharge line. How does the ice guard work in stopping the pipes from freezing? Does the water coming out that�s expose to the weather freeze coming out? An effective and easy solution to prevent sump pump discharge line back-up and guard against flooding, Freeze Relief is an automatic overflow device that allows water to evacuate from the sump basin even if the line freezes or becomes blocked.